Garmin is turning its attentions back to the fitness tracker with the Garmin Vivosmart 3, with wellness at its heart. It's slightly less focussed on sport than the GPS-toting Garmin Vivosport, with stress tracking, guided breathing exercises and sleep monitoring joining exercise detection, rep counting, and of course a heart rate monitor. This is a wearable clearly designed to go head-to-head with the Fitbit Alta HR. It does drop the GPS as a result, unfortunately limiting the new tracker's potential as a running device. It also comes in at £130, so Garmin is targeting the lower end of the fitness tracking market. But do Fitbit, Misfit et al have anything to be worried about? The design of the Vivosmart 3 is functional, but not its strongest suit. The textured rubber band has a more unibody look than its predecessors, giving way to a smooth black strip down the middle that disguises the screen. The monochrome display is completely invisible when off, but it's quite small when on and stops short of the curve. While it might not be too inspiring to look at, it's incredibly comfortable and also waterproof enough for swimming. Unfortunately it also attracts smudges and dust like they're going out of fashion – seriously, it's tough to keep this thing clean. You've got two versions to pick from – small/medium, and large – but its unibody build means you're stuck with whichever size you get, so make sure you pick the right one. You can also pick it up in a choice of black or purple, but the latter only comes in the smaller of the two sizes. Another difference is that the display is no longer always-on, but requires either a tap or a raise of the wrist to wake. The good news is that it's impressively bright, even with the midday sun blasting down on it. But it's also one of the Vivosmart 3's weakest points, as it can be frustratingly unresponsive, especially the raise-to-wake gesture. Skipping through the different screens is done with a swipe up or down of the finger, and then a tap to see more data. For example, with data such as step count and stair climbs you can tap to see your score for the day before, or a tap on heart rate will give you a tiny readout for the past hour along with your highest and lowest readings. So far we've found that it too often misinterprets taps for swipes or sometimes just doesn't respond at all. You have to be direct and bold in your movements, although when water gets involved it seems to get worse. We got caught by the rain on one jog, and had to wrestle with the screen a lot more to get it to do what we wanted. Sadly it's not as good looking as the Alta HR, the device it feels like it's going up against directly. At its most basic, the Vivosmart 3 tracks your steps and heart rate through the day, giving you an on-device readout of your beats for the last hour, including the highest and lowest points. Generally speaking, optical heart rate monitors are much better at 24/7 heart rate tracking than they are at higher-octane activities. With the Vivosmart 3 I've found day-to-day heart rate tracking to be pretty good. My resting heart rate has been generally accurate and has kept in line with the Fitbit Alta HR, which I've been wearing on the other wrist. Often I find the on-display reading is higher, but Garmin's algorithms seem to balance things out in the app. Step tracking has also been good, but as ever, as long as it's not wildly off the mark it's less use comparing results to other devices than it is just seeing how you vary day to day, as the algorithm is going to remain fixed. That said, I found it kept very close to the Alta HR, tending to come in just a little under by the end of each day. For testing the sleep feature, I also put the Vivosmart 3 up against the Fitbit Alta HR, which I've found to be one of the most accurate wrist-worn sleep trackers, and the Beddit 3. I found the Vivosmart 3's automatic sleep detection was good at working out when I had drifted off and woken up, but offered little beyond that. While Fitbit uses your heart rate to work out when you're in REM sleep, Garmin does not, and the sleep feature is a bit limited by comparison. It doesn't, for example, start chucking up insights based on your sleep patterns like some of Fitbit's devices now can. But as I said, accuracy is generally good, so if you just need an overview of your hours and minutes of slumber, the Vivosmart 3 does the job. Another way Garmin is pitching this as more of a health-and-wellbeing device is in stress tracking. This measures your heart rate variability to determine how stressed you are, with a score between 0 and 100. You can also swipe left to see a tiny graph of your stress levels for the past hour, and if you feel a bit bowed down under the weight of it all, you can kick off Relax Timer, Garmin's guided breathing feature. I've found the stress tracking to be more hit than miss. It's done a good job of capturing some of my more stressful moments, but there have been times of calm where it's read highly – and a couple of stressful occasions where it told me I was fine. However, I think there's more value in looking over your graphs at the end of the day, in the app or online portal, to get a general idea of just how stressed you are on a daily basis. For example, you may notice more stress during work hours than time spent outside of the office, or maybe your mornings tend to be more stressful than your afternoons. I'm not someone who finds the guided breathing exercises all that handy (I do like to take a breather every once in a while, but I prefer to do it without the help of technology). Some may find it more useful to get a nudge to take some time out to relax, though. Another new feature on the Vivosmart 3, and something we saw Fitbit debut on the Charge 2, is VO2 Max. This has actually been used on some of Garmin's other wearables for a while now, and is a measurement of the maximum volume of oxygen your body can utilise during exercise. When accurate, it can be a much better stat to measure your fitness with. You'll need to do a brief workout, be that a walk or a run, before Garmin can gauge your level. My VO2 Max score on Fitbit these days is 54. On Garmin's platform I started in the mid-40s, but it has crept up towards Fitbit's score the more I've used it, so expect to see your score grow over a period of time too. Of course, outside of a lab with all the proper equipment it's unlikely this will be 100% accurate, but it's a much better way of gauging your fitness in relation to others in your age and gender bracket – and Garmin will tell you where you stand amongst your peers in the app. So without GPS, can the Vivosmart 3 stand up as a serious running device? There was only one way to find out. Daily heart rate tracking had proven good, but high-intensity activity is another thing, and often where heart rate falls down. Before assessing the quality of tracking, you can start activities either manually or automatically. The parameters for auto-tracking can be set in the app – I have mine to track walking when it sees I've been walking for 10 minutes, and to measure running after two minutes. You can also start a run on the device itself with a long press, and then a couple of swipes down to the little running person. Then a couple of taps later (barring any mis-swipes) you're away. You can also choose what information is displayed on the screen when working out by going into Activity Options in the app. Tap on Run and you'll be able to choose where you want different metrics – timer, reps, heart rate, heart rate zones – to appear. So first, how did distance hold up? I took the Vivosmart 3 out on a few runs and put it up against the Apple Watch Series 2, Garmin Fenix 5X, Wahoo Tickr chest strap and Fitbit Alta HR (which also lacks GPS). On one short run, I found the Vivosmart 3 read 0.2 miles higher than the Apple Watch and 0.23 miles higher than the Fenix 5X. On another 5K run, though, it fared much better, coming in within 0.18 miles of all of them. By default the Vivosmart 3 will guess your stride length but you can also adjust it manually in the app, and I'd recommend doing so for optimum accuracy. The accuracy of distance tracking came as a bit of a surprise, but then so did the fact that Garmin ditched GPS on the Vivosmart in the first place. Clearly it knew its accelerometer data was up to snuff, or at least good enough. If you were to take the Vivosmart 3 out for a three-hour run, you might see a bit more disparity in the results, but otherwise it does a decent job. It's just a shame that Garmin doesn't let you use the GPS on your phone like Fitbit does with the Charge 2 and Blaze. It seems like a small thing to add that could make a lot of difference. Now on to heart rate. Of all the devices tested, the Vivosmart 3 had the greatest tendency to jump high on heart rate. On one run it came out with an average of 150 bpm and a max of 170 bpm, while the chest strap hit 146 bpm and 166 bpm respectively. The other devices came in between. On another run the Vivosmart 3 came out with an average of 154 bpm and a max of 184 bpm, while the chest strap got an average of 151 bpm and hit a max of 170 bpm. On that one the Apple Watch actually averaged highest of all with 156 bpm, but it's clear that the Vivosmart tends to jump a little too high at times. And you can see on the graphs above, it was when hitting those HR peaks that the Vivosmart just went that extra bit higher. Of course without GPS you won't get a map after the run in the app, but you'll still be able to peruse your other metrics like speed, pace and heart rate on both the app and online Garmin portal. I'm not going to delve much more into the app here, as you can go get stuck in to some of our in-depth guides, but it does feel like Garmin needs to give its software some more love. Too many times I've had the app freeze up or crash on me, and I also take issue with some of the layout. It's not the most intuitive to get around, and too often I find myself staring at the loading screen when moving from menu to menu. Beyond running, the Vivosmart 3 is equipped for some strength exercises including weight lifting. I flexed my muscles and gave this a whirl, and it's perfectly accurate as long as you're keeping your extensions nice and full. It sometimes failed to pick up reps when I stopped thinking about it and let my form loosen a tad. Between sets you'll need to tap the screen to tell it you're taking a break, before tapping again to start the next set. Like almost every other wearable out there with a screen, the Vivosmart does notifications. But unlike some others, it supports notifications from all apps on your phone, and you can also use its basic forward, back, play and pause buttons to control your music. Generally – as with most other fitness trackers – I find the screen too small to read messages on, but if it's a case of knowing whether you've got a text from someone important or just another Snap from that friend who just discovered Snapchat, it can be useful. As for battery, Garmin promises up to five days and I've had no problem hitting that. In fact I've actually squeezed out a day more from it. As ever, it depends on how you're using it, but five days is easily managed. 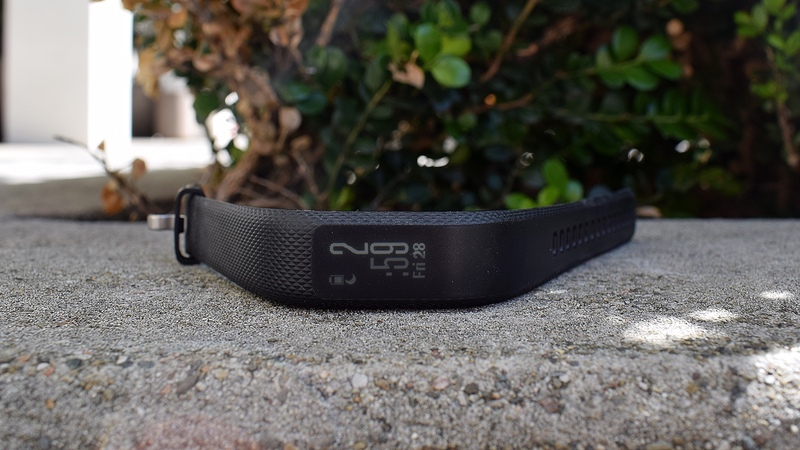 Garmin has re-angled the Vivosmart to make it better competition for Fitbit. The loss of GPS is a shame, even though distance tracking on the 3 is good. But as a daily activity tracker this still offers a lot, including the bonus of stress tracking. The price tag doesn't hurt either, while waterproofing gives it an edge of many of its rivals. It's just a shame it doesn't look nicer. Just bought this a few days ago. Either the strap was broken when I bought it, or it breaks way too easily. I think the clasp was just missing out of the box, and I didn't notice until I charged it for the second time, when I discovered that the pin holding the tongue had started to slide. If the pin slips all the way out, then it would be quite unwearable. Well, I suppose you could tape it closed each time you charged the battery, but I don't regard that as an acceptable solution. I'm taking it back to the store ASAP. Not sure what will be found out, but there are only two possible cases: (1) Garmin didn't check to make sure the clasp was there when they shipped it, or (2) Garmin designed it so badly that the clasp is going to fall off. The second case is actually worse, because in that case there is no way the device will last.